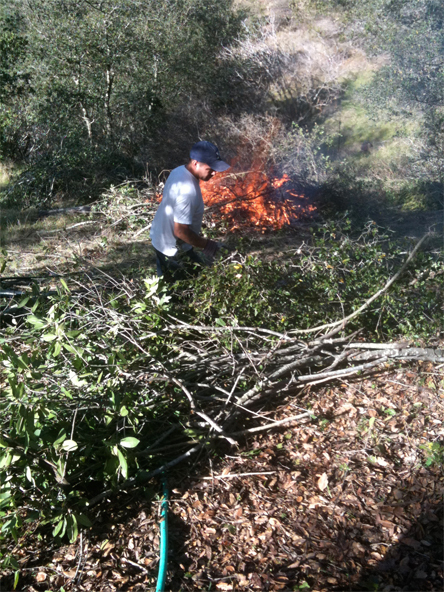 Removing young bay laurels and burning the remains. Photo by Lee Klinger. Workers began chopping down 250 California bay laurels this week in the Santa Cruz Mountains so that 49 signature oak trees might be saved from the infectious scourge known as sudden oak death. The tree-removal project is an attempt by the Midpeninsula Regional Open Space District to prevent the spread of the tree-killing pathogen, which uses bay trees to scatter spores in the forest. Six years ago these California buckeyes in Mill Valley were suffering from early leaf senescence. The owner wisely followed my fire mimicry protocol in treating the buckeyes, and six years later we see that the buckeyes are no longer experiencing early leaf senescence. As can be seen in results from these same trees posted from year 4 and year 5, these buckeyes have not been experiencing early leaf senescence for the past 3 years. 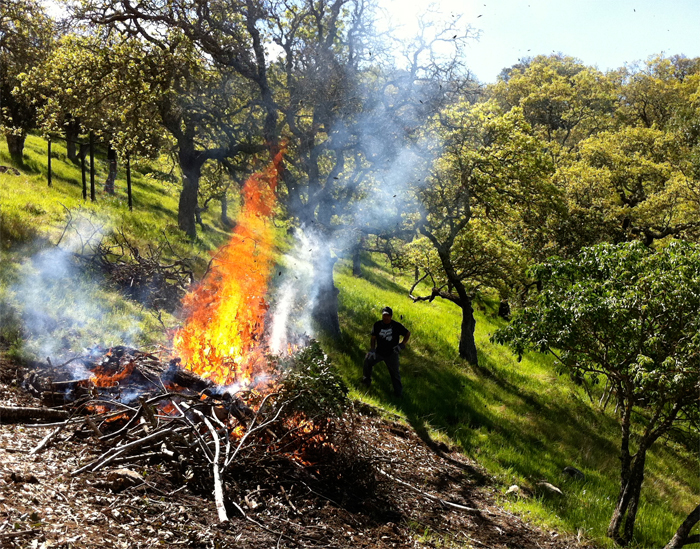 Managed fire in a California oak woodland. Photo by Lee Klinger. The new study, in the journal Castanea, confirms that the people who lived in Illinois before European settlers arrived [Native Americans] were in the habit of setting fires in the region nearly every year, with fires in the Hamilton County woodland occurring at least every two or three years, McClain said. This repeated burning actually stabilized the prairies and open woodlands that dominated the region until the late 19th century, when the fire-suppression efforts of the new settlers allowed different plant species to take over, the researchers said. To all you Californian’s concerned about the oaks, this study is highly relevant.